Indian Head Massage usually begins with working on the upper back and shoulders. A combination of deep massage techniques and using pressure on release points helps to relax and loosen the muscles. Moving upwards, from the back into the shoulders and upper arms helps release tension in the muscles . This helps to alleviate headaches. It also improves the circulation of the cerebral spinal fluid. Continuing with the upward movement, the scalp is then massaged using techniques that stimulate, relax and revive the entire head and scalp. This increases circulation and promotes healthy hair growth. 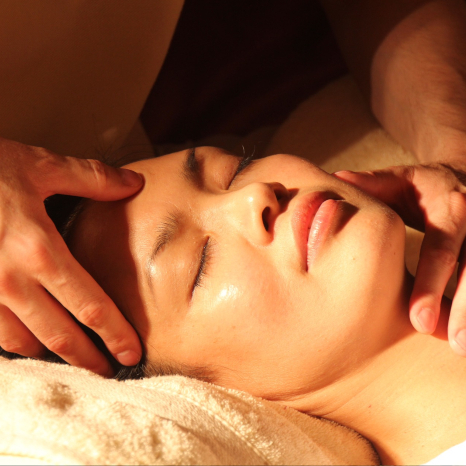 It includes a gentle face massage to aid circulation, improve skin tone, and reduce sinus and headache problems. Aids the circulatory, muscular and nervous systems. Frees knots of muscular tension and relaxes connective tissue. Stimulates arterial circulation, and increases venous and lymphatic flow. Stimulates the skin and underlying nerve endings. Indian Head Massage can be done either with or without oil. Your hair will not be salon perfect after a massage, so if you’re going for the oil option why not allow yourself some ‘me’ time once home after the treatment before heading out into the world again! Pamper Package – why not combine 1/2 hour Reiki with 1/2 hour Indian Head Massage for the ultimate pamper experience for £40.